I didn't keep up with my blog as I had previously planned. This school year was actually my most trying year yet. I had ALL of the behavior problems in my class, which called for tons of suspensions and referrals. I even had five of my boys suspended on the last week of school for tagging up the boys' bathrooms in two of the wings. With the huge stress of testing and WASC this year, it was difficult for me to put a lot of what I wanted to do in place. However, I've been on Pinterest like crazy the past few days trying to find things I can use in my classroom for next school year. I'm also going to be teaching summer school, so I plan on using some of the ideas during the summer and seeing my students' reaction to them. Wish me luck since SS starts bright and early tomorrow. So much for a summer break! I've been trying to do interactive Math notebooks like the teacher at http://www.rundesroom.com. I've really enjoyed looking at her site and using her ideas with my students. Please check out her blog! So I've started working with different types of multiplication and addition properties. I wanted to create a "cheat sheet" for the students to refer back to in their notebooks. I looked at some things online and created my own foldable for the students to glue into their notebooks. It was really easy to create and you can use your own textbook's vocabulary. I love that the kids refer back to it while doing their work. I don't know why I didn't think of this before. I could see how these different things could have really helped my former students with the same concepts. I'm now on Day 3 of the new school year. I found this awesome idea on Pinterest (thanks to http://2ndgradesandcastle.blogspot.com/) and decided to try it with my students this year. 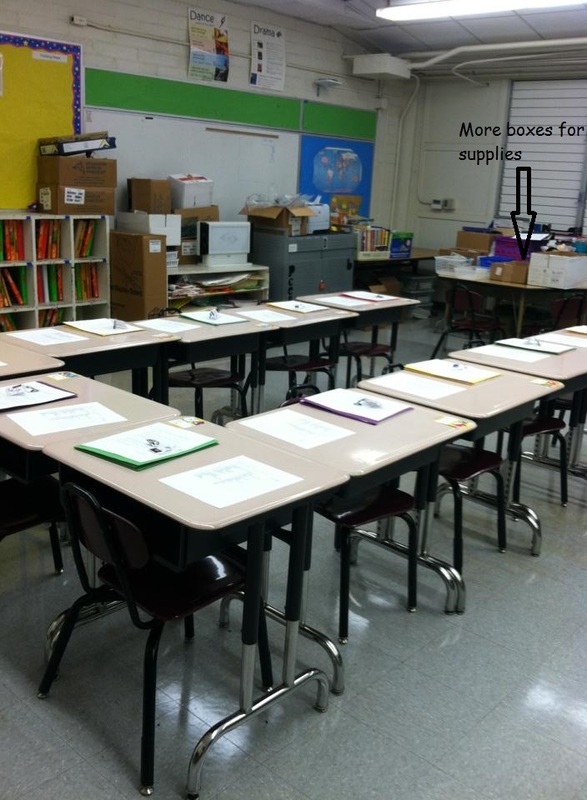 I purchased a box of heavy-duty manila folders and taped it to the fronts (and sides) of the students' desks. The kids love their pockets. 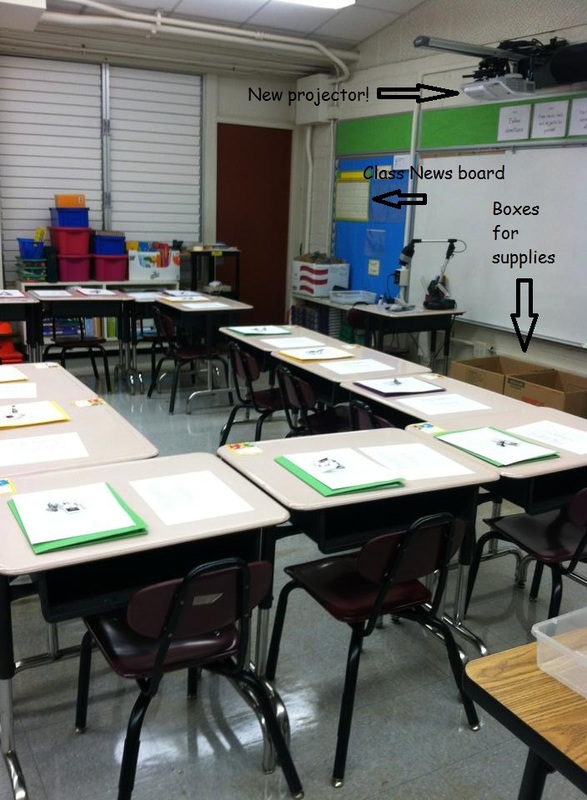 I think this is a great idea since it provides a place for them to stick their incomplete work and not get lost in their desks. It's also easier for me because if students don't know what to do next, I can just say, check your pocket. There are so many other ideas on Pinterest that I want to try. I'll have to see what I can do next. I had posted some photos the other day of the state of my room. I was worried I wasn't going to get the room ready for Open House. Fortunately, I was able to get everything cleaned up. I do plan on staying a little later during the first week to finish "cleaning." Out of all the years at my current school, I think this Open House was my busiest. I had 20 out of 26 families come to meet me and drop off supplies. As I spoke with parents and the students, I felt that they were just as excited to start the year of as I was. I'm hoping for a good year. Will keep you posted on how things go! I've tried starting off the year on the right foot. 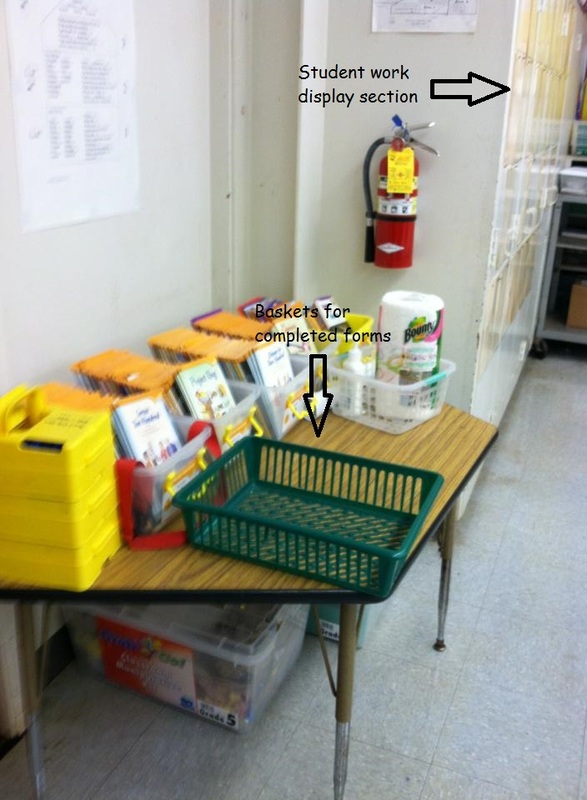 I've tried to be more organized with my classroom library and papers from our 2-day workshop. 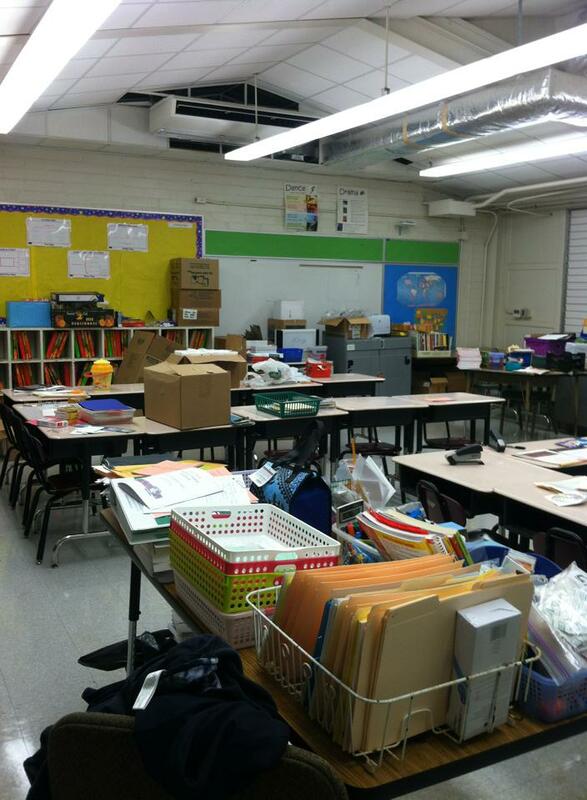 Open House is already tomorrow night and here are some photos that show the state of my room. 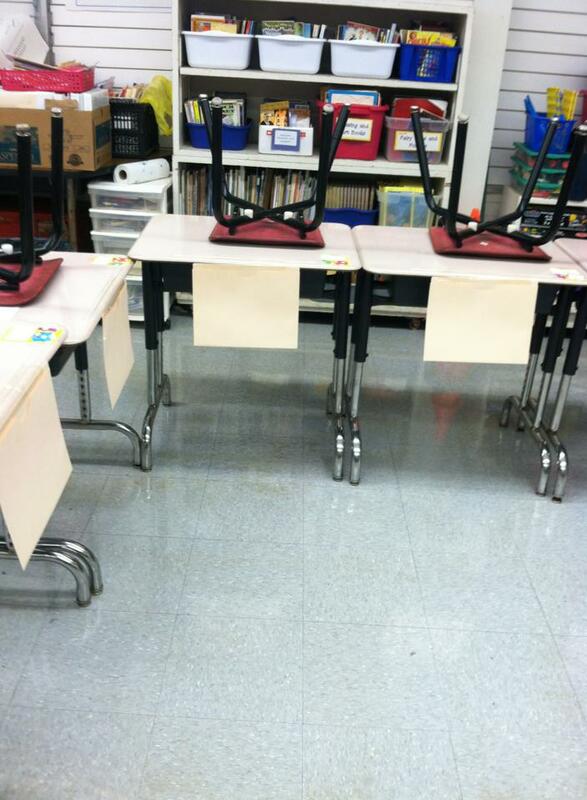 I originally had the desks in rows, but I found that it took up lots of space, so I decided to move them around and create three groups that kind of look like Cs. 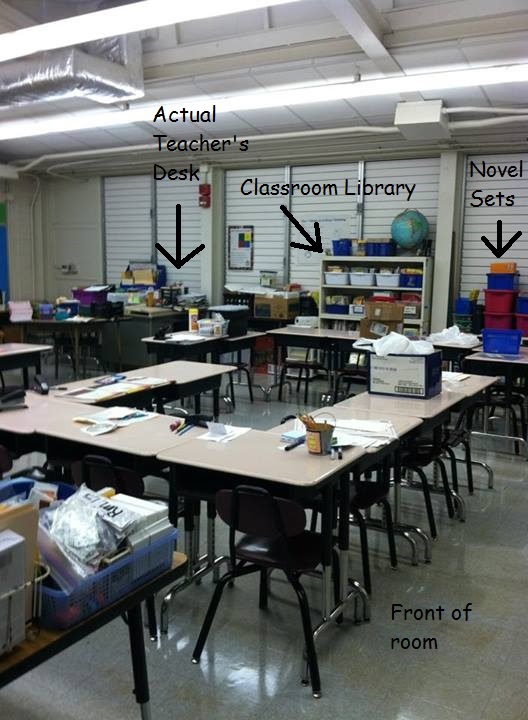 As you can see, I've also put tons of stuff on the desks. I didn't take any photos of the floor, but there are boxes strewn all over the place. The desk with all the baskets and the dish rack is my work desk. Who can work with all that clutter? Sorry the text and drawings on my photos are kind of childish. I only started learning how to use the Paint feature to add stuff on to photos. 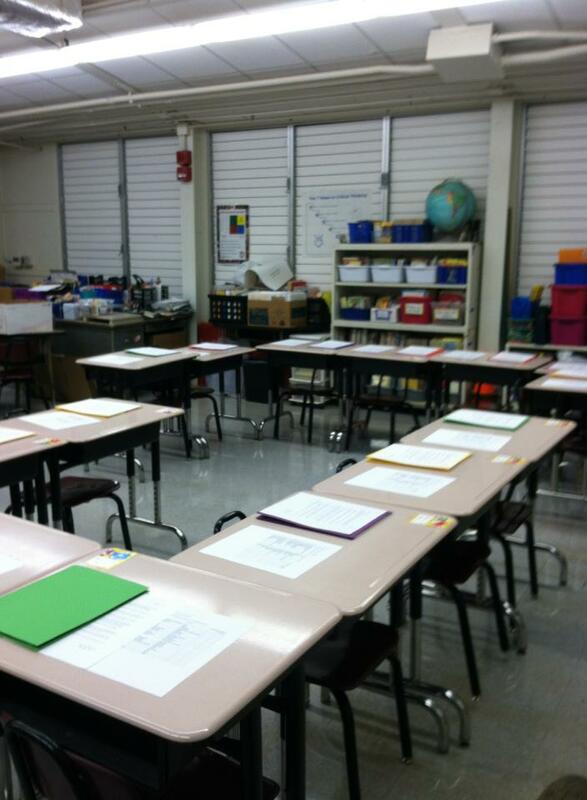 I'll be adding my "after" photos sometime this weekend to show you how it turned out for Open House. After being on Pinterest for a few months now and getting different ideas from various pinners and blogs, I was somewhat motivated to restart my own teaching blog. I think sharing ideas and experiences will only help me improve my teaching and possibly help others in the same situation. We start school with meetings and workdays next week with the students coming in the following Monday. I have that nervous feeling I always get when the school year starts. My room is nowhere near ready and my ideas that I came up with this summer have not come into fruition yet...but I have this weekend and a few more days next week to really get started. I'm hoping that this year will be one of the best ever! It's been a while since I've typed anything in this teaching blog. However, something happened today that I want to remember... I was out at track practice in the afternoon and I saw a bunch of older kids walking towards us. They looked familiar, but I didn't really stare at them since I was trying to focus on the kids running. The older kids ended up being some of my former students from the first year I taught fifth grade. One of them was JCL. He was my favorite kid...smart, personable, and funny. He tells me that he ran for president for his grade level and was voted in. I was so proud of him. He continued to say that he was getting good grades and going to school on time (he was always tardy with me). He kept calling me Miss, so I wanted to make sure he remembered my last name. LoL He did! Oh and he looked genuinely happy that I had gotten married. I hope that in the future, I'll have more kids who come up to me and say hello. I love hearing updates about students. Fortunately, I can still recognize the students for the most part. I know as time goes on, I may not remember names as much.